Need a fashionista to follow on insta? Look no further, I have the woman for you! Audree has styled for: Rimmel, Tommy Hilfiger, Urban Outfitters, L'Oreal, Tiger Beat, Seventeen.com, Covergirl, StyleCaster and Alice+Olivia. Audree Kate Lopez—also known as Audree Kate— is a thrifter, adventurer, maximalist, and total girl boss. She graduated from Arizona State University with degrees in Marketing and Journalism. Following graduation, she moved to NYC where she started her career working in the fashion departments at Glamour, O, the Oprah Magazine and Redbook. Audree transitioned into working on freelance projects at Marc Jacobs, Alice + Olivia, J.Crew, and Club Monaco. 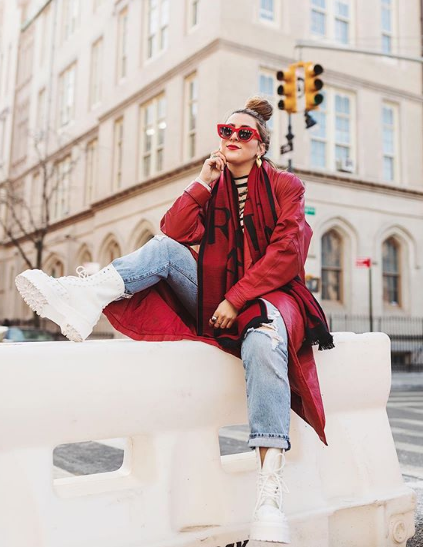 She joined the styling team at Alice + Olivia as a freelance stylist after leaving her corporate job and was the Fashion Editor for StyleCaster.com and freelance market editor for various publications and editorial/celebrity stylists. Audree’s hustle was fueled by her personal experience of not being able to afford going shopping. She recalls always wanting to be a designer and claims her start began by creating something new from 25 cent thrift store finds. She has a DIY sewing tutorial blog for anyone in the same boat as me and looking to #create like Audree! As a creative, Audree enjoys being able to see the entire process of a project from beginning to end. She finds it rewarding to be a part of major decisions made throughout the creative process. For Audree purpose is her mission and intent to serve others. She believes that her purpose in the world is to work in the fashion industry and help others find confidence, empowerment and happiness in dressing themselves, and teaching young professionals skills in order to break into the industry and make their mark! You can find Audree in boots or sneakers running around Manhattan prepping for photoshoots. Her favorite shoe is this leather combat boot from Taryn Rose! When she is not working you can find her thrift shopping, discovering new restaurants around New York City, or hanging out with friends. Audree loves creating “a story” and a “piece of art,” whether it’s with an outfit or a photoshoot. She believes clothing evokes an emotion and she wants to make clothing, something that is ingrained in our daily lives, joyful, fun, and exciting. Her advice to other females hustlers is to take advantage of this present time while people are listening to women, use this opportunity to be vocal. She encourages you to learn and keep going! Audree acknowledges the hardships she endured while trying to break into the industry and the '“lows” she experienced. She holds on to the positive in order to keep moving forward. When faced with difficulties she focuses on the end goal and avoids being consumed by the obstacle itself. To date her proudest accomplishment is the launch of her fashion fundamentals program! In the future she is looking forward to launching her own jewelry or accessory brand, she believes it is the next step in her company. Hustle is one of the many adjectives that describes Audree Kate. From serving looks on the streets of NYC to prepping for a photoshoot, this woman is shaking the world of fashion in the best way possible.